The Margaux, by G.A. White Homes, balances the modern ideal of living with the beauty of the home’s natural surroundings. The design goal of the home was to create a modern floor plan that was warm and welcoming to soften some of the more contemporary design elements of the home. We used an interesting color palate with many unique textures and materials to create an inviting retreat from everyday life. The home’s open concept floor plan offers views of the one and a half acre lot and the woodlands beyond through large picture windows throughout the plan. Upon entering the home, guests are greeted with a welcoming living area complete with a stunning fireplace. The living area of the home opens up to the open kitchen and dining room, complete with a modern walk-in pantry. A generous powder bathroom and the laundry round out the public spaces on the main level. Across from the entry way, a private office looks out onto the stately front yard, while the master bedroom retreat sits toward the rear of the home. The master bedroom retreat is complete with a large bedroom and sitting area, walk-in closet and spa inspired master bathroom. The shower is the centerpiece of the bathroom offering cleansing steam, a refreshing real rain shower, traditional showering and massaging body jets. A Japanese soaking tub rounds out the master spa bathroom. Next going down the wide staircase to the lower level, brings guests to a more relaxed, casual space. The lower level was designed with an open floor truss system to bring a unique modern element to these spaces. The stairs open up into a large entertainment area complete with a home theater, large bar, powder room, and a billiards area. The lower level is finished off with three more guest bedrooms. One of the bedrooms is being used as an exercise room, with the other two bedrooms inspired by the family’s favorite movies. Thank you for visiting the Margaux by G.A. White Homes. We hope you enjoyed your visit! Among the Miami Valley’s most beautiful and prestigious homes are the creations of G.A. White Homes. For over 33 years, Gordon White’s vision has produced visually stunning and distinctive designs, built with uncompromising quality. Distinct, custom designs and diligent craftsmanship achieve perfect harmony. The mark of these fine homes are the enduring quality and style that creates a lasting value and lifestyle for our homeowners. It’s a part of our passion to make your dream home a reality. 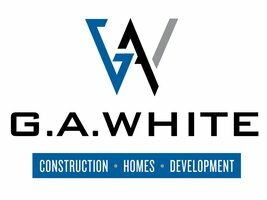 Our company now proudly welcomes the “new generation” of G.A White Homes, Chad and Shawn White. Both brothers are bringing fresh, new ideas and a clean take on the design and lifestyle of the next generation. Together, the blending of the “old” and “new” equal a perfect balance to continue G.A. White Homes’ award-winning reputation.